Paris Terror Wave: Who did it and Why on Friday the 13th? The highly coordinated Paris terrorist attacks could only have been carried out by the Zio-Anglo-American network of intelligence agencies and secret services. In all likelihood this false flag operation was the product of a collaborative effort between the CIA, MI6 and the MOSSAD. Such a complex series of simultaneous attacks, mass murder and bombings has all the markings of false flag operation. The only question that remains is exactly whose flag it will be. The obvious speculation is that this terror wave will be blamed on a Muslim state or Islamic terrorist group or similar entity dedicated to jihad. That the major venue of this crime spree occurred only 200 meters from the former offices of Charlie Hebdo is surely no coincidence. Nevertheless, the only way to ascertain with certainty who was responsible is to answer the question: Who gains the most from such a fastidiously staged event? There is no question that the MOSSAD has deep roots in French society as does MI6. Paris has always been a beehive of activity and well-known intersection of MI6, CIA and MOSSAD agents practically forever. That’s why Princess Diana was quite deliberately assassinated there after taking up her anti-landmine and pro-Palestinian crusade. In the present case, there is obviously a HUGE message being sent to the French people, the current Administration, the Parisian establishment and/or all three. President Hollande is more than likely aware of exactly who did this and why. The key point, whenever it concerns terrorism on French soil, is that the real warning is being sent to Germany. The globalist cabal knows that the best way to get to Germany is to go through France. Hence, Chancellor Angela Merkel is the most likely target of this terror message. Exactly what is that message being sent to Merkel? The answer is contained in the following exposé. The critical point here is that the German-French Axis forms the backbone of the European Union. Were both nations to favorably shift their foreign policy toward Russia, the Anglo-American Axis would collapse in a day and a night. Central Intelligence Agency Director, John O. Brennan, recently met with his counterpart, French intelligence (DGSE) director Bernard Bajolet. The French equivalent of MI6 and CIA is the Direction Générale de la Sécurité Extérieure. [See: CIA-GW Intelligence Conference: Panel on The Shared 21st Century International Mission — GW Center for Cyber and Homeland Security 29 Oct 2015 Panel on “The Shared 21st Century International Mission” featuring CIA Director John Brennan, former UK MI6 Chief John Sawers, Director of the French Directorate for External Security Bernard Bajolet, and former Israeli National Security Advisor Yaacov Amidror.] Held as part of the 2nd Annual Ethos and Profession of Intelligence Conference, co-hosted by the Central Intelligence Agency and the George Washington University. Held on October 27, 2015. N.B. 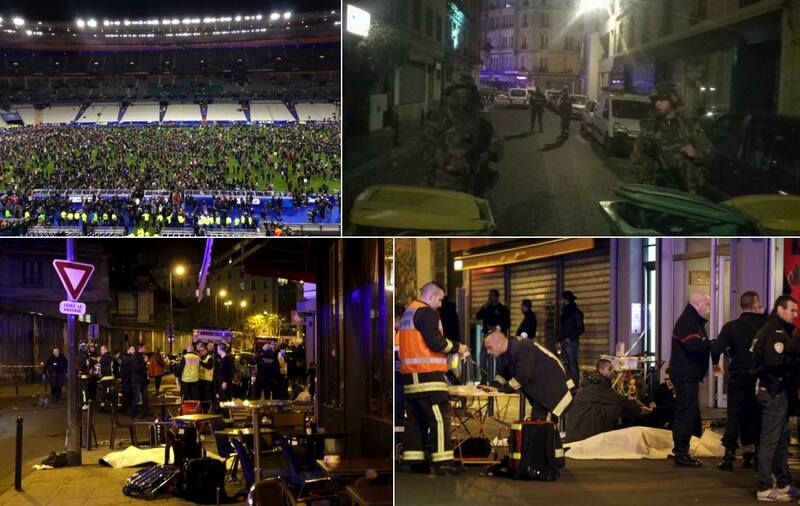 Like every obviously staged false flag terror event, many wonder if anyone really died in Paris. Not only are there many good actors throughout Parisian society, Charlie Hebdo proved that the whole nation could be easily galvanized so that virtually every French citizen, save but a few perceptive souls, became crisis actors on demand. Many have already observed that there seems to be no blood — anywhere — nor are there any expected signs of the type of violence which has been alleged. Because this convoluted false flag operation was purposely executed at night, much could happen – or not really happen – under the cover of darkness. Let’s face it, these terror attacks have become such a regular event that they remind one of a well orchestrated Hollywood production, not too unlike that other form of mind-control programming known as the old “Saturday Night at the Movies”. As always, a real life horror flick, à la Friday the 13th, is staged in a major capital city for maximum effect so that the whole world will watch and tremble with fear.